Here’s a list of all the quilts I completed this year. I keep saying I had a busy year in all of these posts, so I guess I should just learn that all my years are going to be busy now that I’ve added a little boy to the mix! I’ve got another quilt finish under my belt! 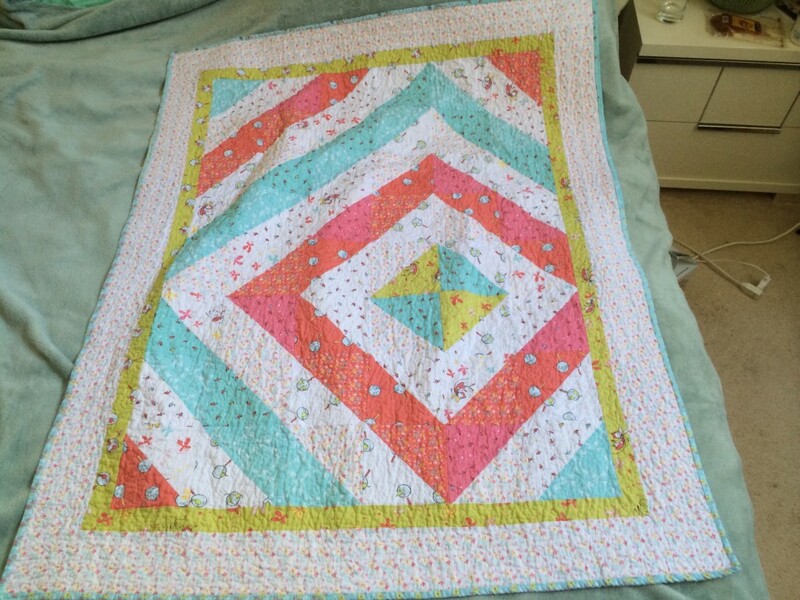 Another baby quilt, I’m swimming in babies over here but I don’t mind. 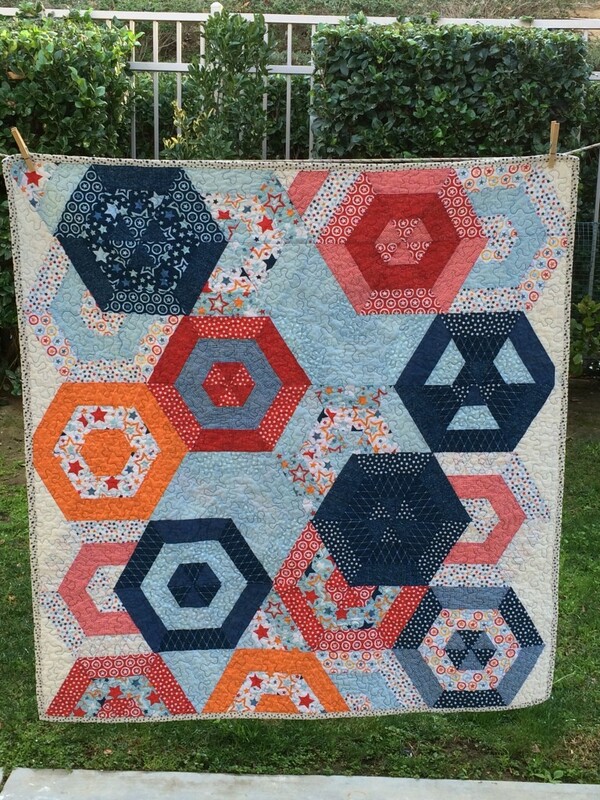 They’re fast and easy quilts to make, and everyone loves getting them. 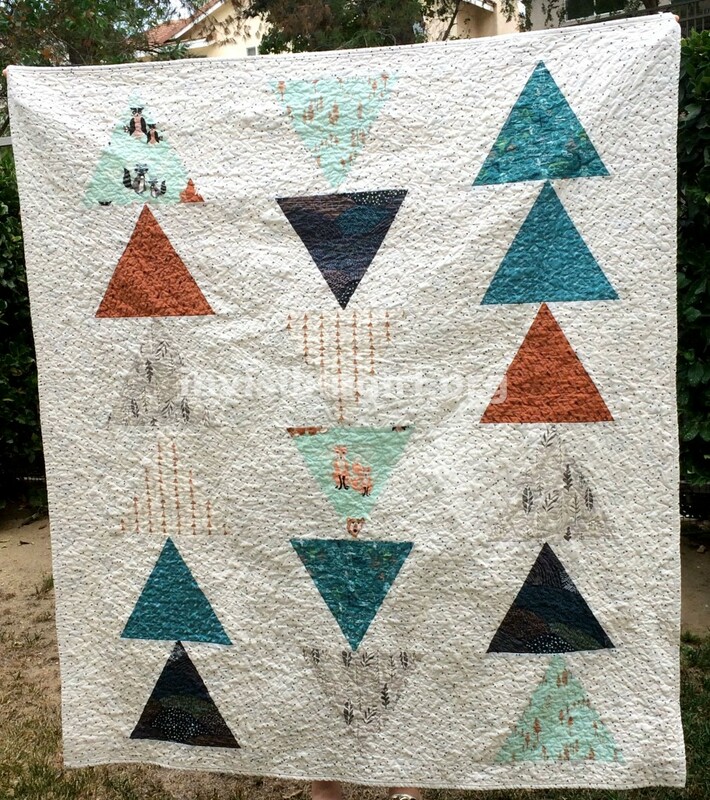 This time I bought a log cabin quilt kit with 1930s reproduction fabrics from Maywood Studios. It was really great because it was mostly pre-cut, too. All I had to do was assemble! I haven’t quilted much since my husband died and having an easy way to get back into quilting really helped. The finished size was a little small for my liking, so I added a border and cornerstone pieces with fabric from my stash. I’m pretty pleased with how well they match the kit fabric. 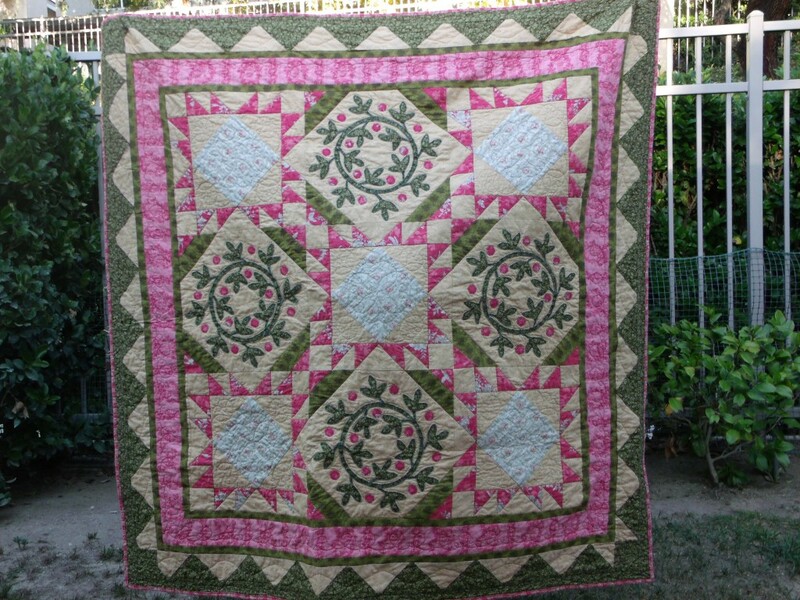 The quilt itself measures 41″x33″ and I quilted an allover stipple with white thread on top and pastel variegated on the back. For the back of the quilt I used various pieces from my stash; the quilt is for a little girl so I wanted to add some more pink to the mix. And I was happy to thin out my stash a little! Another finish under my belt! 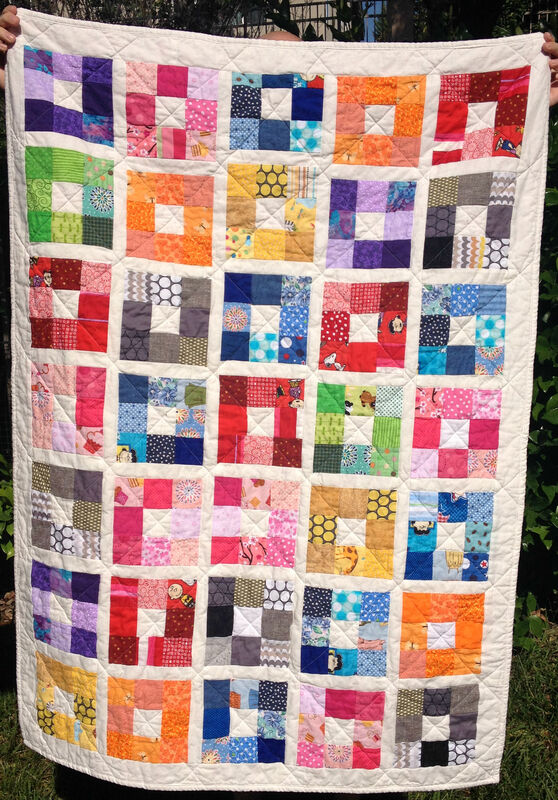 This quilt is a gift for a dear friend of mine having her first baby. 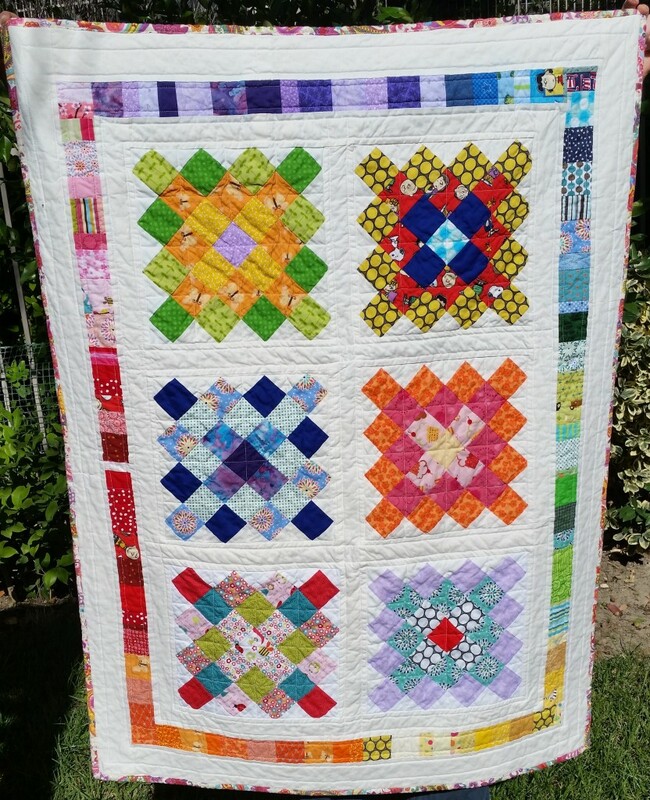 I bought this Hungry Caterpillar Quilt kit from the FatQuarterShop.com. The instructions were great, really easy to follow. I had some trouble with the flying geese units, hopefully I’ll get better at those in time. 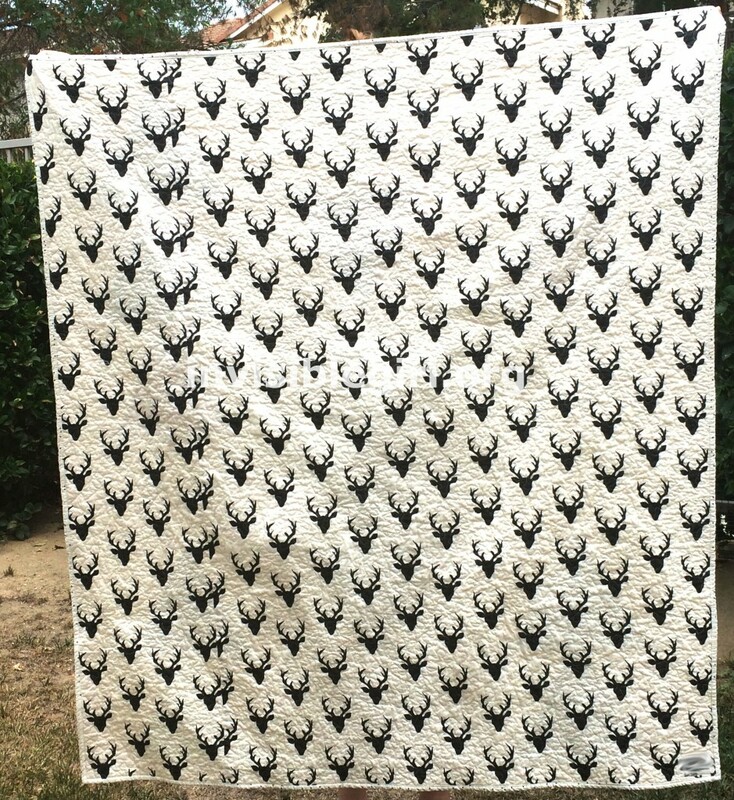 The quilt finished at 49.5″ x 58.” I used an all over stipple in white thread on the top and bottom. Here’s the back. The butterfly panel came with the kit and I used some leftover binding fabric on the back, too. The red fabric was from my stash, happy to get that out!! I just finished the Hungry Caterpillar quilt I have been working on for a couple of months, so I’m happy to show some progress on my numbers! Unfortunately I also hit the remnants bin pretty hard this week, so not as much as I was hoping! 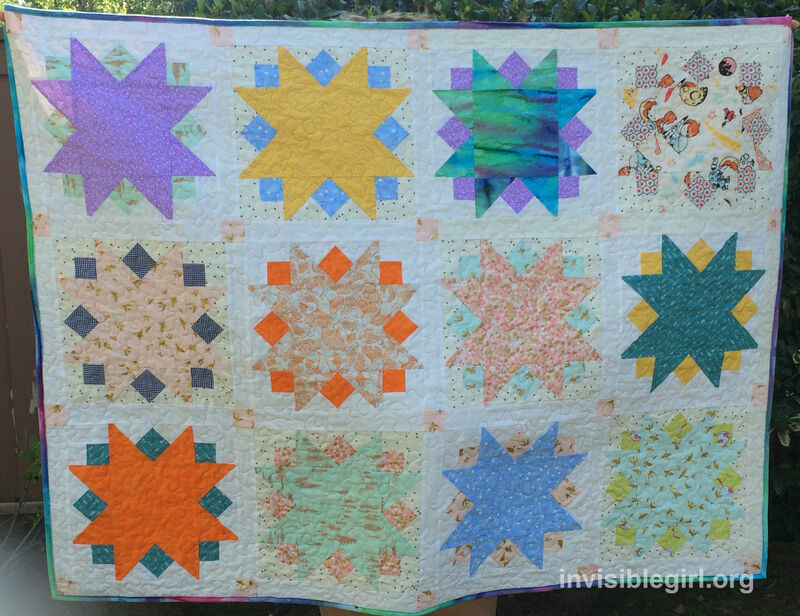 Well the Sunburst Quilt I’ve been working on for just a couple of weeks is finished! 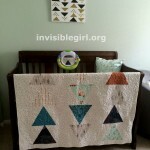 I followed this pattern from the Moda Bake Shop blog, if you’re looking for a cute, quick and easy baby quilt to make, I highly recommend this one. It took me about 15 hours to piece the top, add in basting, quilting & binding… the whole thing probably only took me about 20-25 hours to make. Love those quick finishes. All of the fabric I used was from my stash with the exception of some end of bolt fabric I bought on clearance. Some of it is designer fabric from Art Gallery Fabrics, Michael Miller and more. Others are from the remnants bin at Joann’s, some of it I even inherited from my Mom when I culled through her fabric stash a few years back. 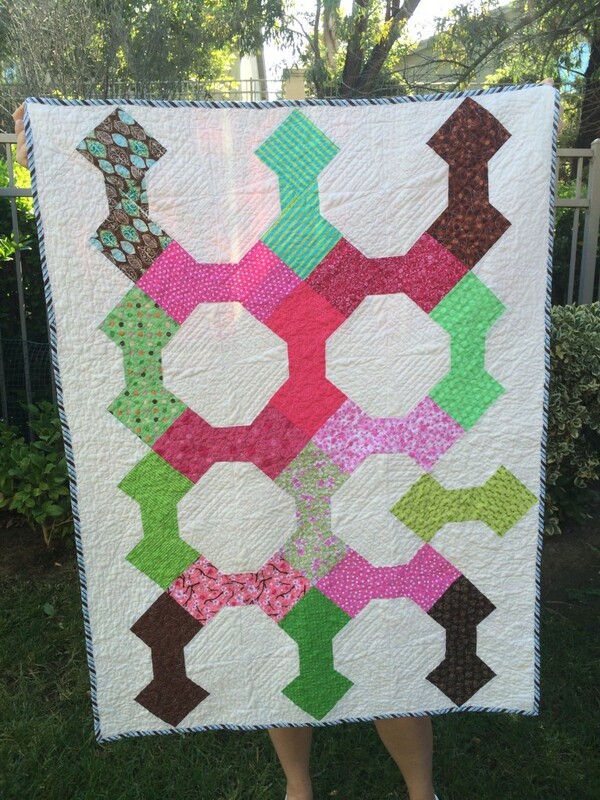 I love it when I can complete a quilt using only fabrics from my stash. Buying fabric is always fun, but I have a limited amount of space to store it now that I have a little guy on the way. These days I am really making an effort to use up my stash and scraps when I start new projects. Usually I like to piece the backs of my quilts with fabrics left over from the front, but since I wanted to get this guy done quickly I decided not to do that this time and just find a big piece of fabric from my stash. I picked this Michael Miller fabric from my stash, it was from the Krystals line from a few years back. It was barely big enough. I got a few yards in a few colors from a lady advertising on Craigslist a while back. Apparently she had a quilt shop that closed up and she was trying to get rid of some of her inventory. I also have red, orange (used on the orange blocks), yellow, green and blue. This used up pretty much all of the purple I got from her. The rest is in my scraps bin. I used the rest of my batik fabric (used on one of the blocks in the top row) to make the binding. I really love how that turned out. The quilting was a free motion stipple done using some variegated thread I had on hand. I was afraid the colors would be distracting on the white background but I think it turned out OK. 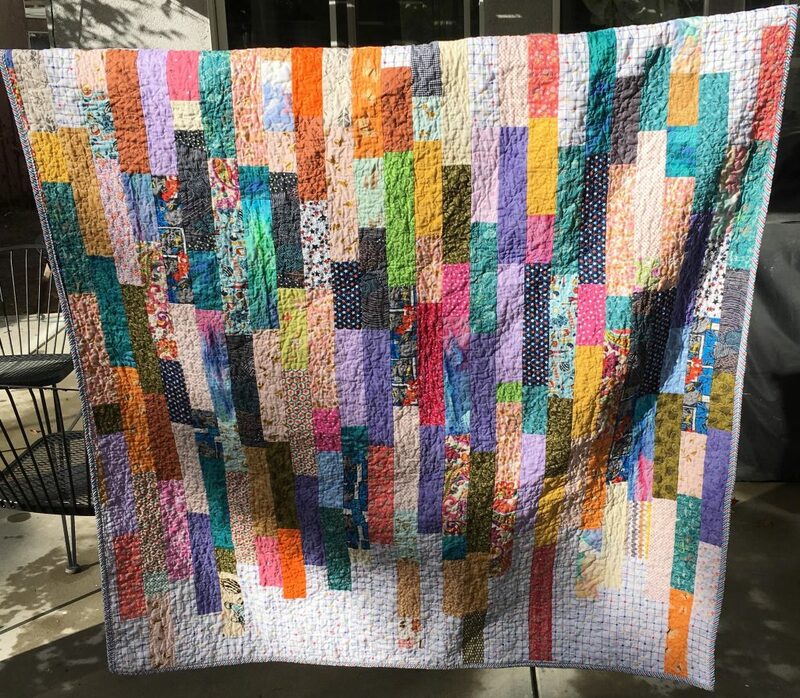 The quilt finishes at about 40.5″x53.5″. 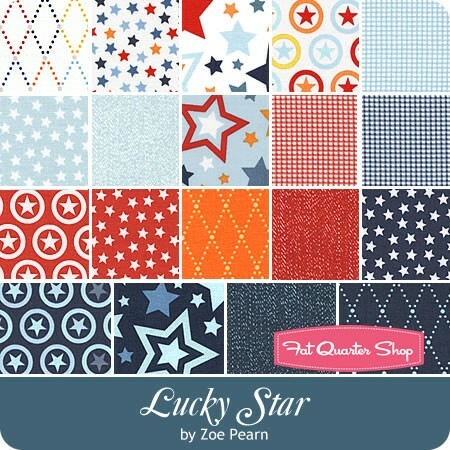 The pattern I used was also a free download offered by Art Gallery Fabrics/Bonnie Christine. 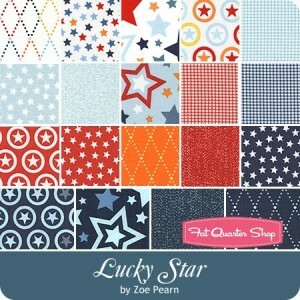 Beware: I encountered lots of mistakes with the pattern when I was putting the quilt together. 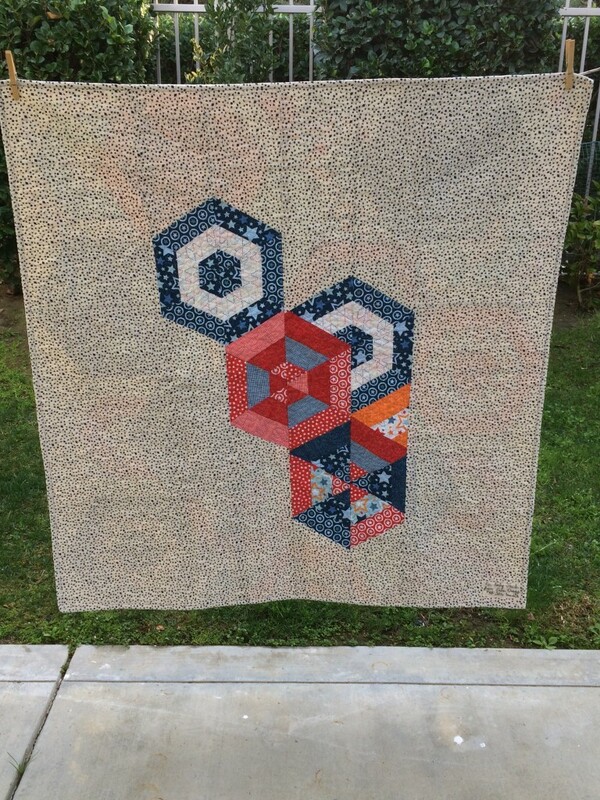 I started emailing them over to AGF and they did update their pattern, but as I was finishing the quilt I found more mistakes and didn’t email those over. If you use your common sense when you’re putting the quilt together, you’ll be able to figure it out. 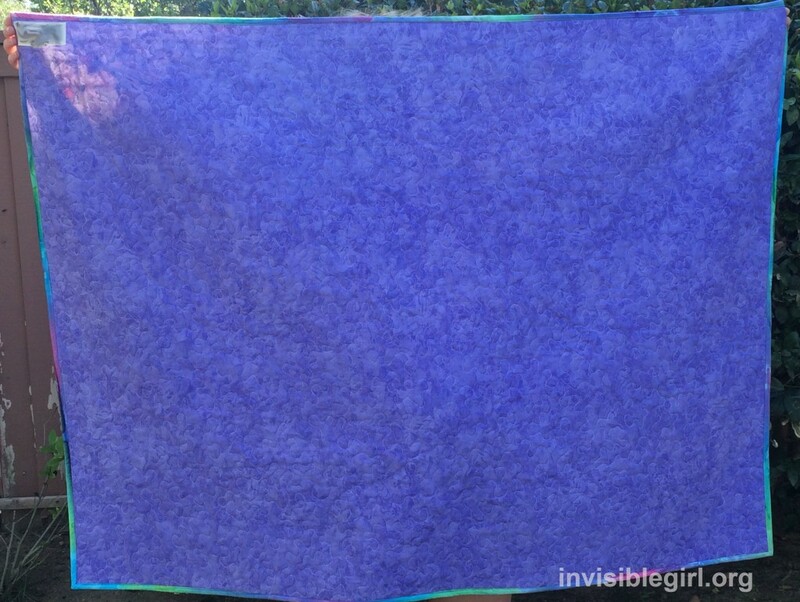 The pattern says it will finish at 53″x60″, mine was pretty close to finishing that size. I’ve been free motion quilting for a little while now, but this was the first time I attempted stippling. I did a pretty large stippling pattern, it is by no means one of those small neat ones. 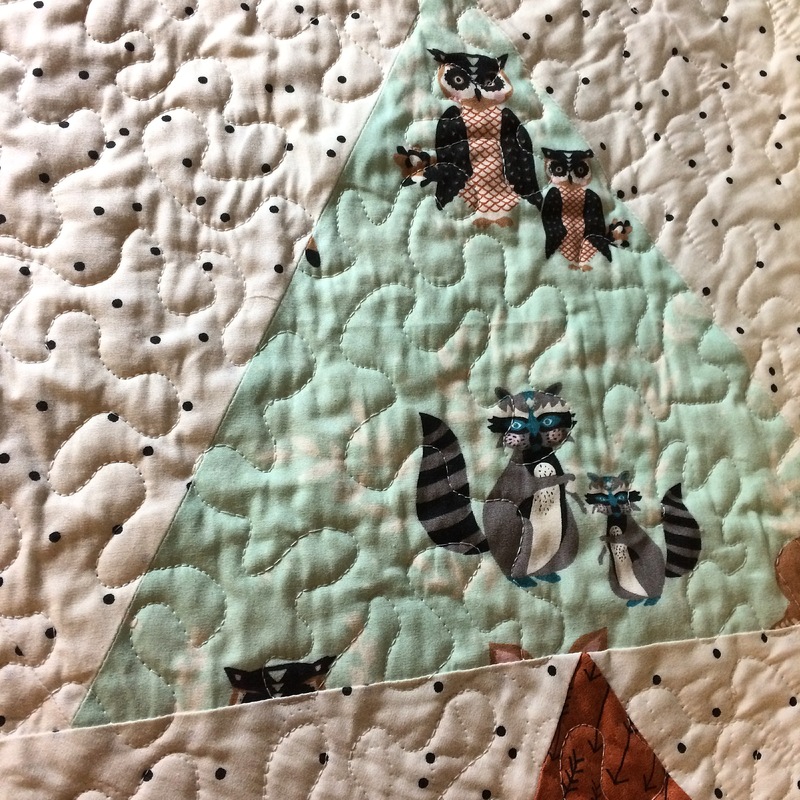 In the past I’ve done mostly loops for FMQ, I found as a beginner it was easier to do those and not have to worry about trying to avoid overlapping quilting. I was pretty happy with how the stippling turned out and I love the texture it affords. 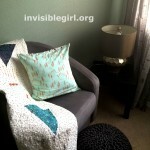 Here’s a couple pictures of the quilt in the nursery. I absolutely love how it turned out! What a crazy year 2014 was. 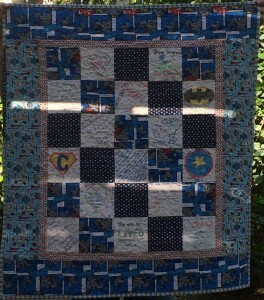 I’m surprised with all that was going on in my life — cancer, selling our business, recovery and ultimately cancer again — I’m surprised I was able to get any quilting done. But it was a nice distraction away from taking care of Mike. 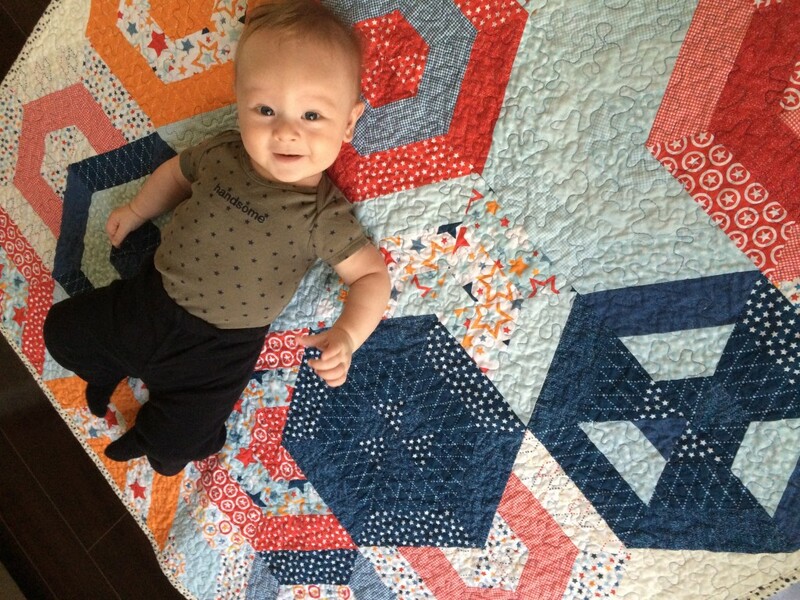 I can’t control his health, but I CAN control how this quilt comes together! !